Satellite images show signs of ongoing activity (steam plume, discolored water) at the new island at least until 20 November. A satellite image from 24 November shows no such signs any more, suggesting that the activity has stopped or paused. The attached MODIS / Terra satellite image from 11 Nov shows a gas plume drifting NE from the new island as well as a discolored water plume extending south. The discolored sea water is likely caused by dissolved volcanic gasses (H2S in particular). A new island has emerged in late Oct at the submarine eruption site, but the exact date is currently not known. At the moment, satellite images do not allow to determine whether eruptive activity at the island continues, but suggest that it is currently low or has stopped. If any, it might be strombolian or the effusion of small lava flows. The last ash /steam plume was spotted a MODIS satellite image on 30 Oct. The submarine eruption continues to produce a steam plume visible on the latest satellite images. No evidence of ash is apparent, suggesting that the vent is still relatively deep. The submarine eruption continues. A small steam plume continued to rise from the new eruption site this morning and an SO2 plume hovers above the area. No ash can be seen on satellite imagery, only steam, and the area of discolored water (indicator of suspended particles) is small if not has disappeared. 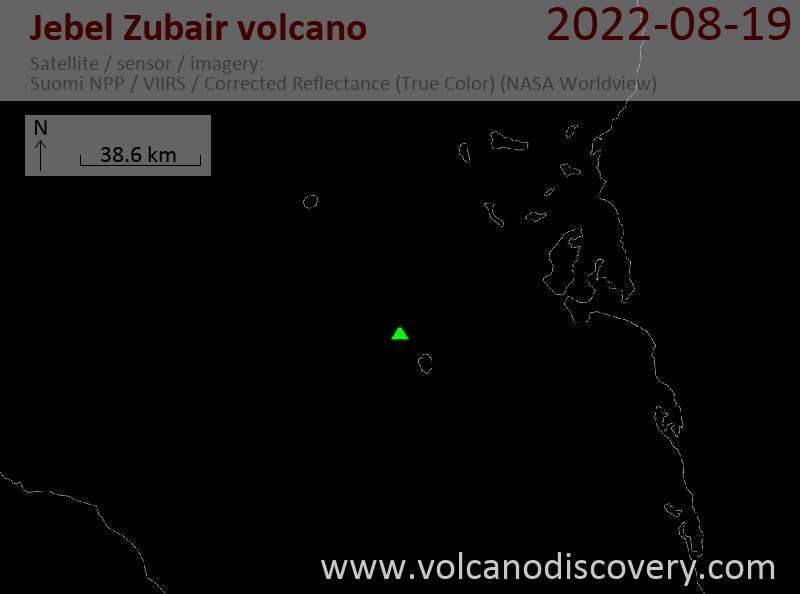 That suggests that the eruption is currently rather weak and probably has not yet entered the so-called surtseyan phase where solid fragments (ash, lava blocks) are ejected above the surface of the sea. No signs of activity are visible on images taken on 27 Sep, which confirms that the eruption started yesterday. The island, whose name yet needs to be published, belongs to Yemen. If it consists of sufficiently large quantities of hard lava flows instead of loose ash and scoria, it will probably resist wave eruption long enough to become a permanent feature in the archipelago, but it will certainly take some time before it can possibly be inhabited (if anyone wants to live there anyway...). This new satellite image, acquired January 7, 2012, suggests that the eruption has risen nearly completely above water. A plume of steam, other volcanic gases, and ash spews from a distinct cone. The land surrounding the vent has grown, and is now about 530 by 710 meters (1,700 by 2,300 feet) across. Once above water, past eruptions in the Zubair Islands were primarily effusive, with relatively runny lava forming thin lava flows. Auf youtube ist mittlerweile ein dramatisches Video des jüngsten Vulkanausbruch im Roten Meer in der Zubair-Inselgruppe westlich vor Jemen aufgetaucht. Das Video wurde von einem Militärhubschrauber aufgenommen und zeigt die neu geborene Insel noch in der stark explosiven Phase, bei der sich Magma im Kontakt mit Meerwasser explosiv mischt und zu riesigen Asche und Dampfwolken führt. Leider ist das Datum des Videos nicht angegeben, es dürfte aber um den 22.-23. Dezember aufgenommen worden sein. A large steam plume, generated by evaporating sea water at the entry of lava flows into the sea is seen on the satellite image, drifting north. The island has apparently passed through an explosive Surtseyan phase very quickly, probably because the erupting basalt lava was poor in gas and because the output rate was high, so that the vent could be sealed from water access in short time. 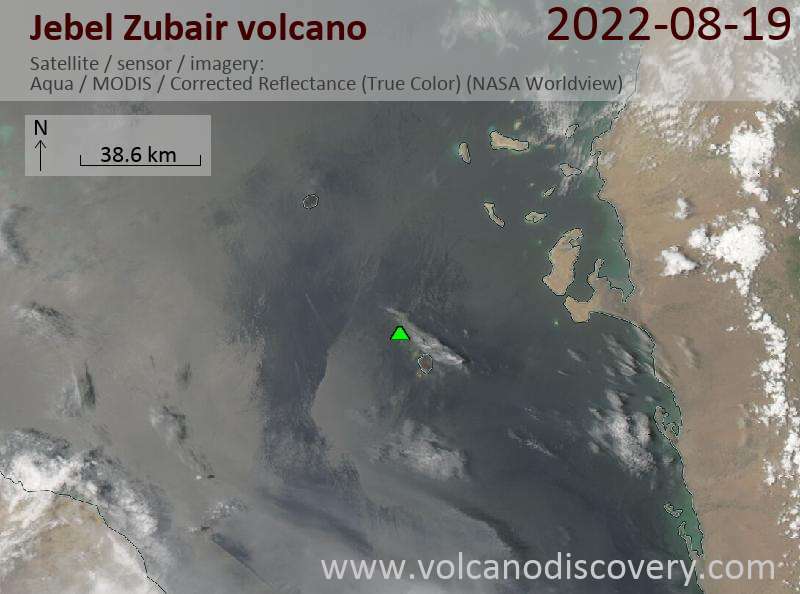 MODIS thermal image of the area of the reported eruption (the Zubair islands are in the center). No hot spot is visible, which could indicate either the eruption was extremely short and small, or there was another cause of the report. Aref Hamoud, a reader from Yemen confirms us the original report, that an eruption happened on 19 Dec on "Saba Island Coordinates: (Lat. 15° 5'13.38"N Long. 42° 9'10.12"E)", and that people in the area could feel a quake associated with it that day.